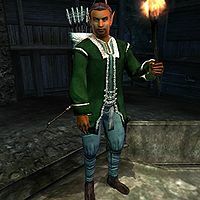 Ungolim is a Bosmer assassin living in Bravil, and the target of an alleged Dark Brotherhood-ordered assassination in the A Kiss Before Dying quest. It is revealed in the Dark Brotherhood questline that Ungolim is the leader of the Black Hand, the Listener. He routinely visits the Lucky Old Lady statue each night, which is where he receives the list of people to visit that have performed the Night Mother Ritual. If you attempt to engage him in conversation, all he will say is, "I'm sorry, but I'm really not one for engaging in conversation. Please, leave me." Ungolim leaves his house at 5pm every day and makes the short walk to the Lucky Old Lady statue. He will then stand beside the statue, performing his duty as Listener of the Dark Brotherhood. After he has finished hearing who has prayed to the Night Mother, he heads back to his house at 2am. Perhaps knowing the grim fate that awaits him, he paces around his house without ever eating or sleeping, until he heads back out the next day at 5pm. Ungolim wears a green brocade doublet with a matching silk garment and green velvet shoes. He wields a leveled bow, from which he fires silver arrows. He carries his house key, his torch, and a small amount of gold. As a member of the Black Hand, Ungolim has permanent resist magic 50% and resist normal weapons 50% abilities on himself. Ungolim, along with Alval Uvani, are the only Black Hand members who can be located without starting the Dark Brotherhood questline. Ungolim is also the only one to maintain a consistent schedule up to the time of his death. In the game, it is stated that Ungolim is a Listener in the Dark Brotherhood and also belongs to the Black Hand. However, in the construction set, Ungolim is only listed as a member of the "Dark Brotherhood -- Won't Call Guards" faction (editor ID DarkBrotherhoodNoGuard). This faction does not have any ranks. The information listed in the summary box is the construction set faction, because this is the information that controls the NPC's disposition, dialogue, and responses to scripts; see Factions for details.